I’m off on a week’s vacation in Provincetown, which, as you may know, has been the home of a thriving art colony since the late 1800s. The Provincetown Art Association was founded in 1914, encouraging summer students to paint by the sea (which they still do), with a lot of modernism influence from European artists who had migrated here. I have learned that for two decades there was a resistance to the influx on modernism in Ptown, but, it persisted as one of the most active locations for modern experiment in America, especially after the Great Depression (1929–1940). Let’s look at some artists who worked in Ptown. 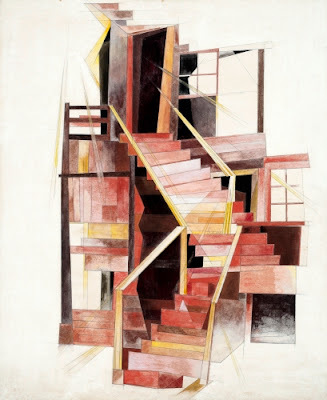 I always think of Charles Demuth first when I think if Ptown, because of all the American modernists of his period, he, most of all, took influences from European modernism and created a truly American vision of it. Initially trained at the Pennsylvania Academy of Fine Arts, already before World War I (1914–1918) he had abandoned his academic training to concentrate on watercolors and gouache. These were coming into their own as standalone media, embraced by artists who experimented with modernism due to their easy fluidity. Demuth ultimately became a master of water-based media on a par with Winslow Homer (1836–1910) and John Singer Sargent (1856–1925). His mature style was informed by Cubism he had seen at the 1913 Armory Show of European modernism, as well as from his group of friends in New York. They included Marcel Duchamp (1887–1968), the pioneer Dadaist and Surrealist, and Marsden Hartley (1877–1943), an American modernist who had dabbled in non-objective abstraction after stays in Germany and Paris. He was also a steady participant in Alfred Stieglitz’s (1864–1946) modernist experimental Gallery 291 in New York, where Demuth’s works mirrored the modernist experiments of Georgia O’Keeffe (1887–1986) and photographer Paul Strand (1890–1976), whose reductive, close-up, angled works have been given the name Precisionism. Demuth, while influenced by modernist experiment, kept his work firmly rooted in his American experience—his life growing up in Lancaster, PA, and his summers in Provincetown, where he produced this gorgeous, Cubistic work. I swear I’ve seen these stairs on my many trips to Ptown. And you can bet I’ll take watercolors to Ptown so that I can do a pale imitation of some of these great artists who painted there and possibly soak up their auras! American art retreated from modernist experiment that had flourished before World War I, mostly because Americans—tired of the horrors of the European war—rejected anything European, including abstraction. There was a brave group of artists who founded the group American Abstract Artists in 1936 in New York to promote such work in this country. Blanche Lazzell was one of the original members of that group. Born in West Virginia, Lazzell knew by the first decade of the 1900s that she wanted to be an independent-thinking woman artist. She studied at the University of West Virginia, and at the Art Students League in New York. 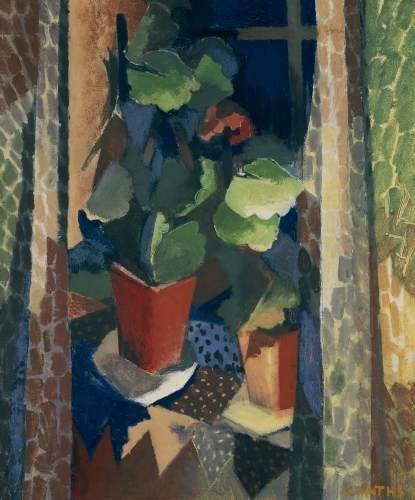 She, however, rejected academic avenues and travelled to Europe in 1912, where she became enthralled with the copious amounts of experimentation in abstraction. She stayed in Paris a year and returned to West Virginian in 1913. In 1915, she went to the Provincetown Cape Cod School of Art for the summer. She went back in 1916, when she became proficient in woodblock printing. In 1918 she moved to Ptown permanently. This study for a painting was quite revolutionary, when viewed in comparison to what was dominating American art at the time: American Scene Painting. 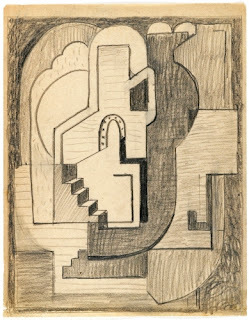 It shows a personal adaptation of the Cubist visual vocabulary. 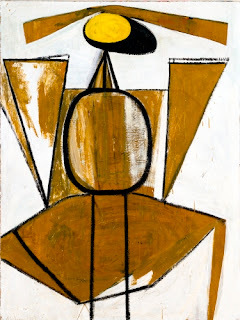 One of my favorite American modernists from the Ptown period is Karl Knaths, maybe because his name is Karl or because he’s a Midwesterner, like me, and maybe because he studied at the School of the Art Institute of Chicago, where I also went briefly. Born in Wisconsin, he studied in Chicago, where he received academic training in painting for four years starting in 1912. When the 1913 Armory Show traveled to Chicago, Knaths was a student guard for the exhibition, and was immediately drawn to the modernism he saw from European artists, particulary the Cubism of Picasso, but especially by the late, faceted landscapes of Paul Cézanne (1839–1906). Knaths was one of many modernists who never studied abroad, but garnered rich influence from European abstraction through personal research in literature, and contact with other American artists interested in modernism. He was particularly affected by Vasili Kandinsky’s (1866–1944) book “On the Spiritual in Art,” which inspired Knaths to make a connection between his painting and music. In 1919 Knaths moved to Ptown, finding an active community of artists interested in modern experiment, away from east coast cities that were then dominated by American Scene Painting. During the course of the 1920s, Knaths was an active voice advocating for a more prominent place for modernist artists in annual Ptown exhibitions. In 1927 he helped establish a separate annual exhibition for modernism there. Knath’s beautiful, personal version of Cubism combined the faceting seen in the work of Braque and Picasso with the bright palette of Juan Gris (1887–1927). By the 1930s he had established a strict formula for his abstraction, based partly on Mondrian and Kandinsky, although his work never strayed totally for physical reality. Oh boy, I have a lot of favorites when it comes to painters who love COLOR, and Hans Hofmann is one of them! As a German who studied in Paris, rather than Berlin, to absorb modernism, Hofmann’s painting style is an amazing synthesis of Cubism, Fauvism, and Expressionism, which I think you can see in this painting. After teaching in Germany, Hofmann was invited to teach in the US in 1932. Fortunately he stayed here, because Hofmann’s contribution to the development of Abstract Expressionism and an indigenous American modernist movement cannot be undervalued. When he arrived in 1932, he found American art stagnating in the Ash Can School, Social Realism, and American Scene Painting. He recognized that American modernism was “repressed,” and needed a voice. He established the Summer School for Art in Provincetown in 1935. 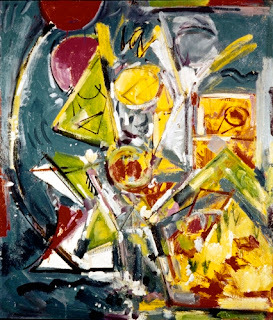 Hofmann not only transmitted the abstract vocabulary of Fauvism, Expressionism, and Cubism to his American pupils. The modernism that grew out of their experience with Hofmann was further energized by the particularly American energy that resulted after the US emerged as a superpower after World War II (1939–1945). By 1937, due in large part to Hofmann’s considerable persona, modernism became part of the annual exhibitions in Ptown. Many of the Abstract Expressionists and their circle were Hofmann students in Ptown, including Jackson Pollock (1912–1956) and Arshile Gorky (1904–1948). I will admit that I did a little happy dance four winters ago when I discovered Robert Motherwell’s studio/house on Commercial Street in Ptown. It was right after I had begun to really dig into the importance Provincetown played in the development of American Modernism, and it just felt like one more verification that I was on the right track in my ideas about a phenomenon that does not get a heck of a lot of coverage in American art history texts. Like Arshile Gorky and William Baziotes (1912–1963), Motherwell was one of the Abstract Expressionists most impacted by Surrealism in his work. He trained under Swiss-American Surrealist Kurt Seligmann (1900–1962) in New York in 1941. In 1943, the Chilean Surrealist Robert Matta (Roberto Sebastián Antonio Matta Echaurren) (1911–2002) encouraged Motherwell to explore collage, a medium to which he would frequently return. Matta had studied with Hans Hofmann in Ptown. Motherwell’s earliest paintings were combinations of forms inspired by Picasso’s work, and ovoid and geometric shapes that would symbolize his later paintings. Motherwell bought two studios/houses in Provincetown starting in the late 1950s, after he married fellow abstractionist Helen Frankenthaler (1928–2011). He enjoyed painting by the ocean, perhaps influenced by his upbringing in California.